The Maidstone & District Motor Services Ltd. began bus services on 22nd March 1911. 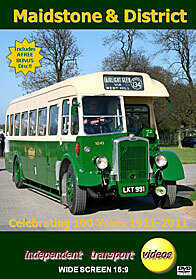 On Saturday 9th April 2011 – 100 years since its formation a gathering of M&D buses and coaches, ancient and modern took place on the Kent Showground at Detling, near Maidstone, Kent. Our programme starts in the morning as the vehicles take up their positions on the showground and in the newly completed Cornwallis Exhibition Hall. Bus services then began running around the showground. Mostly made up of M&D buses and coaches, such as an Albion Nimbus, AEC Reliance, an open top AEC Regal I, a Metrobus and a Bristol VRT. These were joined by a Bedford from Malta, an open top Routemaster, a Portsmouth TD4 open topper, a Thamesway Leyland National and even a former Crosville Bristol RE! (Crosville being no stranger to M&D, as a number of Leyland Nationals were loaned to them in the 1980’s), just to mention a few! At 15.30 the Cavalcade of former M&D buses and coaches paraded around the showground. This started with the oldest – a Hallford open staircase double decker with solid tyres – going through the ages to the present day. We then recorded the exhibits, both M&D and guest vehicles leaving the ground. To conclude this part we have a short sequence from the 2010 Herne Bay rally of Bristol K (HKE 867) in service. The bonus disc has archive footage from the video camera of Malcolm King of AEC Regal (HKL 836) operating the Cotswold Tour from Stratford-upon-Avon in 1990. We also feature a few shots of M&D buses and coaches from the early 1990s. We hope you enjoy the celebration with us!